In his 19 March article for ScienceBlogs, Von Klaus Schmeh provides us with an update about the filming of an exciting CNN documentary about the famous Kryptos sculpture located in the CIA courtyard in Langley, Virginia. NCMF board member Ms. Elonka Dunin plays a starring role in the film. Schmeh's article includes some of the many photos taken during Elonka's last visit to see Kryptos, as well as her notes from her meeting with Kryptos creator Mr. Jim Sanborn, who also stars in the film. Several other Kryptos aficionados appear in the film. Photo of Kryptos by Elonka Dunin. 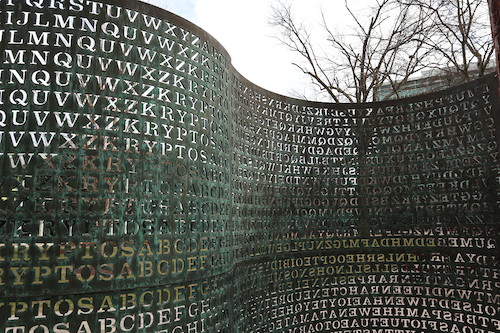 Kryptos, a sculpture made of stone and copper, was created by US artist Jim Sanborn in 1989. 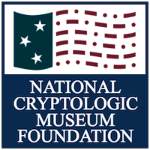 As it is not accessible to the public, only very few of the many Kryptos enthusiasts have seen the original of the sculpture. Only about ten photographs of it could be found online. In spite of these clues, nobody has been able to decipher K4 so far. Considering the huge interest Kryptos has created over the last two decades, it comes as no surprise that CNN has decided to produce a TV documentary about it. It goes without saying that Elonka Dunin, the world’s leading Kryptos expert (I’m sure, she knows even more about Kryptos than its creator Jim Sanborn himself) plays the leading role in it. I don’t yet know when the documentary will air, but Elonka told me some interesting items that were learned during the filming. The filmmaking took place during the first March weekend in three parts: one in Langley, Virginia, on the grounds of CIA itself, one in Elonka’s home in Rockville, Maryland, and one in Jim Sanborn’s studio in Piney Point, Maryland. At Langley, Elonka Dunin and Ed Scheidt were allowed entrance. For Elonka, this was only the second time she has seen Kryptos, with the first one being 17 years ago. 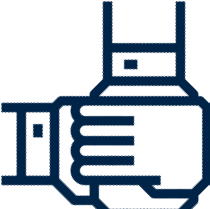 In the Maryland portions of the documentary filmmaking, several other Kryptos aficionados took part.......READ MORE.